-----Adaptability is the key to survival. This is true whether you live on 42nd St or in Nome. One of the most fundamental adaptations is to climate - in February, New York City isn't Nome. -----For creatures that breathe air and live on the ocean, like those who cruise a C-Dory to Alaska, survival is clearly delimited by climatic factors. Relatively few major factors affect climate: altitude, proximity of land and water, latitude, seasonality, and oceanic currents are primary. -----Altitude is unimportant - sea level is the same off the coast of California or Juneau. -----Proximity to land is, in a sense, unimportant. The central ocean is a vast desert for life, as circumnavigators will attest. The mere sight of an Albatross in the deep ocean conjures mystical reactions, so who wants to circumnavigate a C-Dory? Most cruisers travel within sight of land. Close to Land - Is that green mark on shore? -----This leaves but three delimiting climatic survival factors for C-Dory cruisers - latitude, seasonality and ocean currents. High latitude cruising is cold, since the sun's rays slant at the top and bottom of the round Earth. Seasonality, however, overcomes latitude. Earth's summer tilt toward the sun makes for long days and tolerable warmth in the high latitudes. 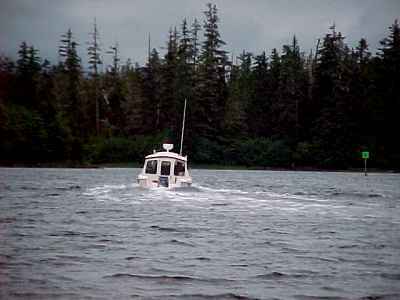 Therefore, during the summer season, a cruise to Alaska is possible in a C-Dory (not that it isn't possible in February, but you might want a psychiatrist as crew). -----That leaves one major factor to affect the cruising climate of the Pacific coast - a major oceanic current - and it is vitally important. ----- Earth's surface is mostly water - we are the Blue Planet. If you were to toss a pebble at Earth from space, the odds are, seventy percent of the time, it would land in salt water. That surface skim of salt water, the World Ocean, overlies the revolving Earth's rocky crust. The spinning Earth imparts motion, currents, to the oceans. -----These currents are not random. The fat bulge of the Earth at the Equator spins faster than the Polar regions that lie on the top and bottom 'edges' of the 'ball.' Consequently, the world's ocean is driven faster, by the east to west spin of the Earth, near the Equator. Thus (in the Northern Hemisphere), oceanic currents are heading westerly just north of the Equator. When they run into a continent, the spin deflects the current to the north. In high latitudes, the current flows easterly until it bumps into a continent, and then it returns to the south to replace the water driven west by the Equatorial Current. The rotating earth makes the waters of the North Pacific churn in a clockwise rotation: westerly just above the Equator, northerly past the Japanese islands, easterly along the southern edge of the Aleutian Islands, and finally to the south along our West Coast. Therefore, to say it simply, the North Pacific waters move in a great clockwise gyre. -----Water is an amazing substance. One of its marvelous characteristics is its ability to (slowly) absorb heat, and (slowly) release its warmth. There are Penguins in the Equatorial Galapagos Islands due to the cold current moving southerly along our west coast and westerly to the Galapagos. The same current, now heated by its long passage westerly near the Equator, and then northerly to Japan, allows Japanese folks to swim in comfort three seasons of the year. The warm current travels easterly across the top of the North Pacific, carrying warmth to the Aleutian Islands (and fog, when the heated air over the warm water smacks into cold Arctic air over the Bering Sea). ----- When that same oceanic current strikes the North American continent, it heads southerly along Southeast Alaska, completing its clockwise circum-pacific path. It has lost most of its warmth while traveling through the North Pacific, and it is cold (relative to summer continental temperatures) in Alaska. Consequently, Southeast is cool in the summer. However, when winter comes and the continent rapidly loses its summer warmth, that same current is now relatively warmer than the adjacent coast, and imparts a relatively mild and wet winter on Southeast Alaska. 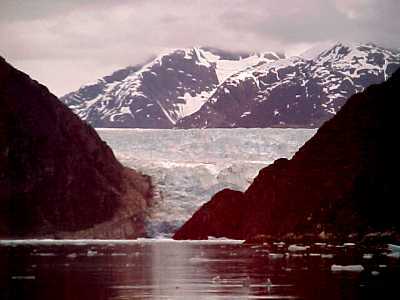 -----Therefore, it is much colder in the fjords of the Inside Passage in summer than it is in Fairbanks. We have traveled throughout Alaska, and we have been far more bundled (in July) in Tracy Arm than along the Yukon. Halcyon has now been in Southeast Alaska for more than a month, and our on-board thermometer has yet to reach 70 degrees. -----Climate is a dominant aspect in cruising. 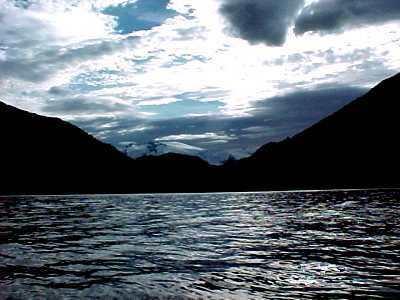 A cruise through Southeast Alaska, is dominated by latitude, season, and oceanic current. 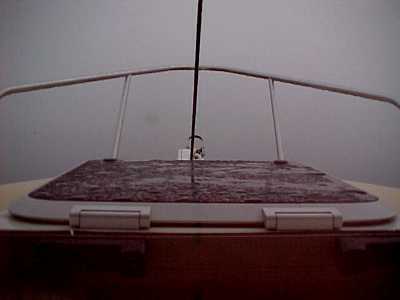 It is certainly taking your boat closer to the top of the world - a cruise to the edge.